Today I return to ISH for what will be the fourth semester in a row. As much as this may sound like graduate school routine – it is actually quite a miracle to me. The last time I left ISH to return home, it was utterly uncertain that I would return. As I am writing this, from a plane over the Atlantic, excitement and gratitude leave butterflies in my stomach. Why the fuss for a student home, in which you share a room and have no more than a cupboard, bed and desk, you may ask. Well, it is such a fortune, to be able to study across the world from home. Dozens of helping hands and scholarships have brought to life formerly foolish dreams. But in this moment, the joy is particularly centered on my specific destination: 1825 R Street is my direction for the supershuttle, once I pass customs. “To ISH” as drivers confirm by now, will mean “to my best friends in Washington”. Every semester at this house has held a gift box of its own: New faces became the gate to beautiful hearts and minds, awkward introductions gave way to invigorating (late) dinner talks. Some tears were shared and victories celebrated, stress was danced away and dreams serenaded on the piano. It always began just like this: A visa, a flight, a shuttle from the airport- and ISH filling with new and old residents for another term. What will the House have in store for us this time? Beloved friends left ISH over winter break and are dearly missed. But a few of us, who, shared the very first day at ISH, embarking on the journey of graduate school, have stayed for three semesters. We will now share the final stretch to graduation. The old crew, “running mates”, and cherished friends. A former Housemate say goodbye at the end of the fall term. To us, the house will be as familiar as a home, while also brand-new, with dozens of residents arriving for the first time. Together we will once again travel the world in Sunday salon talks from politics to pop culture. 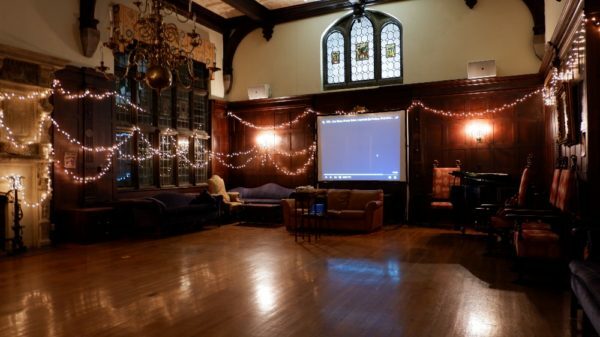 The cozy Great Hall will give refuge with its patient piano, after tough days. The study room will be our shared space for academic workouts. We will visit new embassies and welcome guests from across D.C.’s society. Such rich experiences- I would not want to miss it. Whom will I share dinner with this semester, and with whom my room? Tonight, when I arrive, will be the quiet beginning of new friendships. Of course, with the semester well underway, the stress of grad school is already omnipresent. But first: pure joy of coming home. This house is full of music! We all know them: these people, who always have a song on their lips, a rhythm in their fingers or an unbelievable ability to take the stuff of everyday and turn It into instruments: Few combine all three of these types, but many at least fit one. To all of them and other musically inclined: You’ll find some treats at our House. First, we are blessed with a piano. I can’t overstate the beauty it adds to our home! Up in the great hall it stands preciously, waiting for those who play like professionals and those who- like me- just know their childhood melodies or practice a bit of sheet music here and there. It’s a great comfort to know that however challenging the day, those who know how to make music can always go up there and play a bit. Secondly, we also have two guitars- generously donated by previous residents and tenderly cared for by current generations. Any day you may find someone singing pop, folk, soul or traditional songs from his or her home country with the guitar. This makes ISH so fun. The library, dorm rooms and dining hall are far away enough for readers not to be too disturbed by these sounds. Rather, you may recognize a melody softly playing from afar and enjoy the free, calming background. But above all, we have quite a few music-enthusiasts among our fellow residents! Some even bring their instruments from home, others use piano, guitar and vocal chords. This way, so many impromptu bands have already formed spontaneously. Our good friend Tito has entertained a small crowd with his songs one Friday night, Sun, a longtime resident, sparks gratitude and joy when she frequently practices Chopin and more. Just before Christmas, we came together by the fireplace to sing pop and Christmas folk songs a capella. 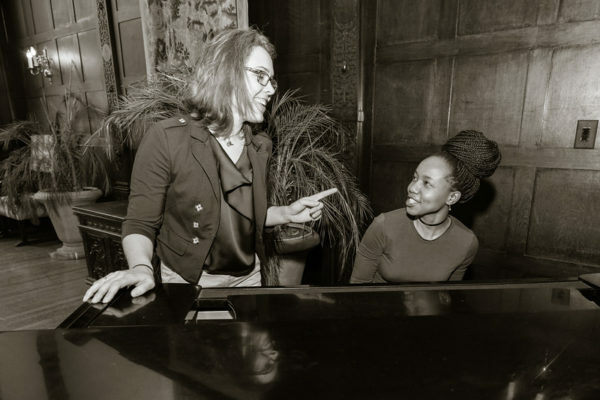 Ben, a fellow resident and I, are about to start practicing a duet together, and last years’ jam sessions with Joelle on the piano and a small choir forming around her one random weekday night are unforgotten. What joy in each of these music moments. Nothing brings people together quite like this. It remains fascinating to hear songs from all parts of the world here, year-round. And a joy to explore playing new songs together in evenings, on weekends, whether spontaneously or in weekly practice. Musicians and music enthusiasts- welcome to ISH, you’re in the right place. If you just arrived at ISH and would like to make some music- no matter how long ago you last played or sang- come find me or join one of the music practices going on. We’ll form another impromptu band – for one moment, and many to come. 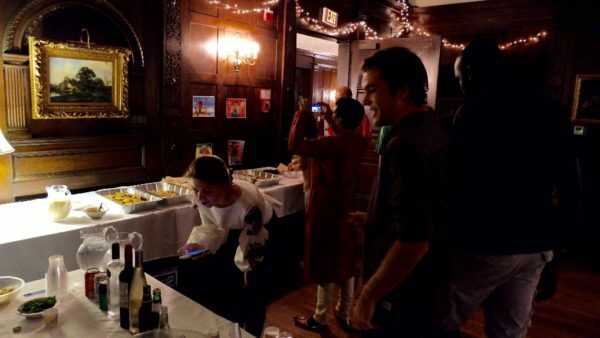 International Student House has a way of turning the average Saturday night, even the average Thursday night into something extraordinary- a music fest, a culinary feast or a fun philosophy contest. Besides our resident salon which happens at least every other week, none of our events have a set rhythm to them, and yet no month goes by without several. Picture 1: Oh, the stories our great hall has to tell! Of many cultural nights for sure. Here it glistens in fairy lights, ready for Bollywood! It usually starts with a small talk conversation in the hallway, library or dining room: “Hey, next week is Mexican National Day, let’s do something”- and once the idea is out, enthusiasts take care of the logistics. Usually, those whose home country has reason to celebrate, approach house leadership about possible dates and times and organize food, drinks, music and a live act of dancing, singing, origami or a quick presentation on whatever topic they prefer/the celebration centers around. Then the invite goes out to all residents and the blackboard boasts a colorful new poster. 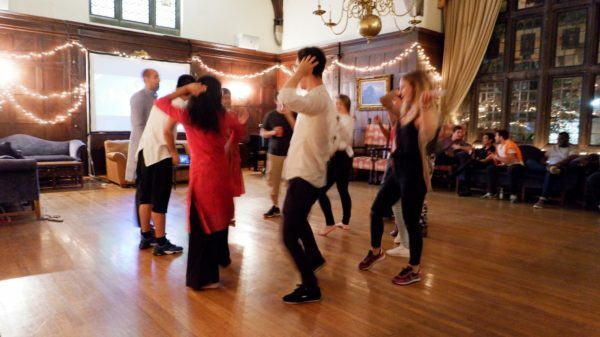 On September 9, we had a wonderful Bollywood dance party. I had noticed last year that quite a few residents enjoyed watching Bollywood movies and we felt it was high time to all get together and learn some new moves. Picture 2: Quick! A picture of amazing food, before it disappeared within minutes  . Delicious! Raghuveer, Meghna, Gayatri and others did a wonderful job of turning this Saturday night into a Bollywood frenzy. 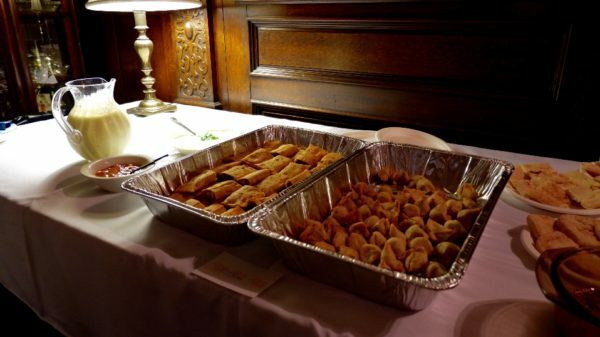 The Great Hall was decorated festively, and we were thrilled to find a buffet of delicious snacks next to the bar: Homemade Mango-cardamom lassi, vegetarian and meaty samosas and more! Last but not least, many residents brought out their finest traditional outfits, bringing the color and elegance of Bollywood to life. Picture 3: “Bring clothes you can dance in” was the advice, and so we did! Notice XY’s beautiful dress in the background. The motto “Snacks and Drinks and crazy moves” really did set the tone as we learned dancing moves together. Joyful rhythms and group dance at its best let everyone shine. Even working at the front desk right below our great hall, one could feel the vibes! I think the pictures give you some idea- there was bliss in these beats and moves; as one resident put it: Boy, I have not danced like this in years. Needless to say: We all eagerly await the next Indian Night. Picture 4: So, you think you can dance? Absolutely! And this was a small group compared to later songs … Fun! Note: A big thank you to our resident Tran Thi Thuc Huyen for the pictures! It’s amazing what richness of experience, perspectives and insights comes together at the International Student House. Much has been written about it, more said, and still it stays an endless well of discoveries! As John Glenn said: “we have infinite amount to learn from nature and one another”. All of the up to 90 people at ISH at any given time, can tell unique stories of life around the world and share lessons from their studies, projects and life experiences. Many of these insights could go untapped, if it was not for one cherished tradition at ISH D.C: The residents’ Salon. The Salon is our weekly get together on Sunday nights, inviting every resident to share a story from their life, an insight from their studies or information about their country with fellow residents. It may also be pictures and lessons from a journey they took, or a teaching session for a skill they have mastered. Topics range across all aspects of life and society on our planet! 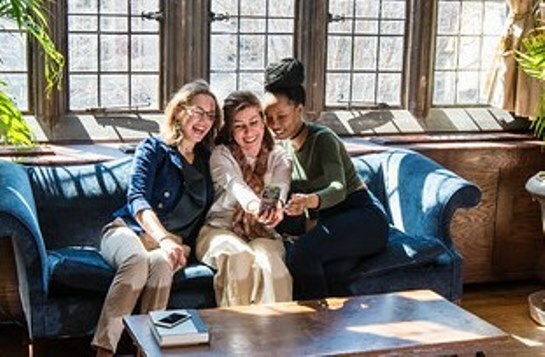 During my time, here at ISH, we have, for example, learned the lesser-known aspects of stress and stress management from psychology student Aman, and travelled to Finland for a night of Finnish history, sweets and first steps to mastering the Finnish language with Hilkka, who interned at the Finish embassy at the time. More recently, Jonathan has told us about the political economy of his home country, Nigeria, helping us understand interdependencies we must be aware of as global citizens. Beyond our curiosity on countries, cultures, and each other’s travels and studies; current affairs often make the perfect occasion for a residents’ Salon: Hence, with the Turkish Referendum that was held in mid-April, we were grateful to learn some more about the situation in Turkey and the decision from our Turkish fellow resident Cem. 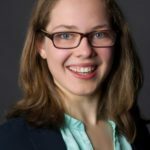 A Sunday before, Rose shared insight from her research on one of the most heartbreaking cruelties of our time, sexual violence as a weapon of war. With her talk, Rose has raised our awareness and made us sensitive to the challenge our generation must address. It’s important to look at issues like this one, and encouraging to do it with fellow students from all over the world. Together we explore and elaborate how we may learn from insights and apply them to our life and work. We can thus think of the residents’ salon in many ways as a commentary, think tank, cultural exchange and research lab run by us, the residents, together. There is no obligation to contribute, yet there is no question that everyone has something uniquely valuable to share! Hence, as you come to ISH, it’s always fruitful to ask: With all that is going on around the world, what would I like to better understand? And what is a lesson or experience I can share, for my fellow residents to learn from? Lastly, with all the different nationalities in the house: of any country represented here at the house, what have I always wanted to understand? The Residents’ Salon is a chance to explore any and all of these topics: a casual get-together with snacks and conversations that help us understand one more piece of our world, one Sunday at a time. So, whether you are a new or long-established resident, what would you like to learn about, what would you like to share? Find a fellow resident to pick the topic for some next Sunday’s Salon – and let Alex, our Salon coordinator know, when you’re ready. A lively, inspiring chat awaits and I, for one, can’t wait. Our house’s immediate neighborhood is elegant and quiet, with many embassies and offices spread out around an otherwise residential area. As you leave ISH you can always meet neighbors walking their dogs or going for a run. Although it is quiet around the house, Connecticut avenue and the actual Dupont Circle are just a block away, featuring businesses from supermarkets to Cafés to bookstores. And not just any among those either! 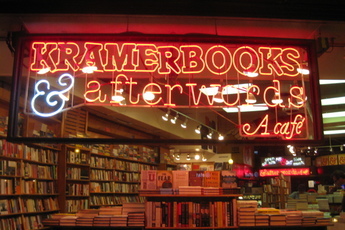 Kramer Books is one of the most popular bookstores in D.C. for very good reason. A 5 minute walk from ISH, this spacious bookstore is packed with books of all genres and gives you an excellent taste of what America is reading right now. From politics to economics to arts – everyone will find both the talk of the town and beloved classics here. Many residents, myself included, enjoy a Saturday afternoon rummaging through Kramer Book’s shelves, discovering a multitude of books we have to read, commenting contemporary America or delving into core topics of our own research. This store is always worth the trip. 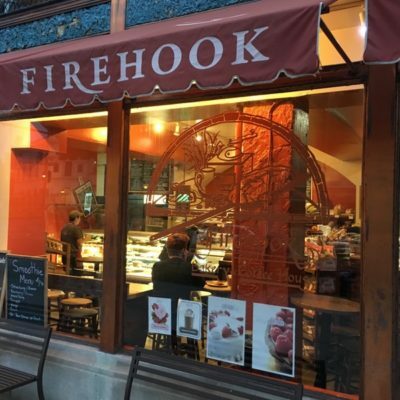 Right next to Kramer Books, on the corner of Connecticut Ave and Q Street is Firehook. A small, cozy bakery, with wooden floors and counters, offering cozy window seats, artisan bread, paninis, soup and smoothies, with great options for any time of day. This really is a cute bakery with the neighborhood atmosphere and nice staff you may long for in a big city. Connecticut Ave and Q, 2 minutes-walk from ISH. If you are looking for great coffee and excellent pastry at an unbeatable price, Un je ne sais quoi…. ! is the place to go. It has to come second here, because I found this absolute treasure only late in my stay and am now never getting real treats anywhere else! Petit Paris, as I would dub this place, is located on Connecticut Avenue, a 6-minute walk from ISH, past Kramer Books and just across the actual Dupont Circle. The small, bright Patisserie française is run by a French couple (from what I could tell) and not only a wonderful opportunity to practice your French, but also truly the best place to get coffee, croissant, brioche and amazing French pastries. I have treated myself to a couple of visit now and was never disappointed. A quiet place to study, with a cozy corner sofa or great window seats, and also the best choice to pick up a croissant or coffee to go in the morning. Extra tip for birthdays or just that one special treat: their tarte au chocolat is magnifique! 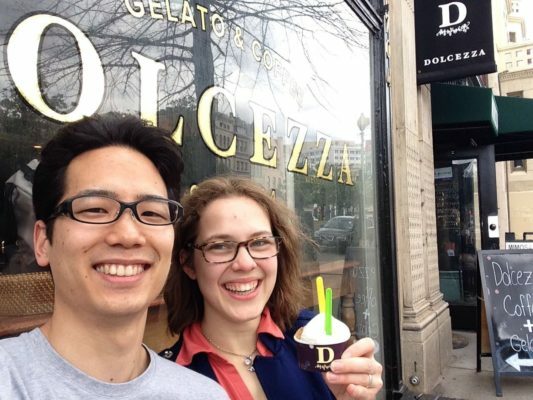 Alternatively, sweet-tooths or gelato fans moving in around the summer: check out Dolcezza near the corner of Connecticut Ave and R Street- their artesian ice cream features flavours from coconut to lime-basil to salted caramel. It’s a great welcome-treat to enjoy on your first summer night in D.C. – I’d know because a wonderful fellow resident took me there the night I first moved in. Food: With breakfast and dinner provided at the House, most residents still go grocery shopping every week to stock up on snacks and lunches. For that, I have three recommendations: Close-by, on 17th street, is Safeway with a classic supermarket offering. A little bit further, about a 20-minute walk, on 14th Street, is Trader Joe’s with less of a product range but a great quality-price ratio and many healthy snacks. Even fresher and more local is the Sunday’s Freshfarm Farmer’s Market that comes to the Dupont Circle area, spread along on the side of Connecticut Avenue between R street and the circle. I highly recommend a visit, with or without a grocery shopping list: Here you’ll find the locals do their shopping, can taste a multitude of offerings from fruits to granola to cheese, bread, pizza and ice cream. The quality is good and prices are fair. Above all, you can support local farms and artisan products. From 8:30 am to 1:30 pm, enjoy a stroll along the market- including a local artist making music nearby! Banks: For many Internationals the banking question is not easy to answer. Near ISH, you have Bank of America, PNC and SunTrust all in very close proximity. Conditions vary, but at least location-wise, these three are a good bet as their offices are all within a 5-minute walk from the house. Other utilities: For any household utilities you may need, CVS is your best bet in the ISH-DC neighborhood. The store is located right at the corner of the Dupont Circle and offers anything from beauty and bathroom products, to stationary, cleaning supplies and medicine (it is also a pharmacy). For office supplies, Office Depot, up North on Connecticut Avenue is also a good bet. Dupont has a lot to offer- which is why some of its nicest places can easily go unnoticed. I recommend a walk around the block to find your favorite places, when you arrive. As always, there’s always current residents to ask for good spots as well.